Skulls of criminals. Tavecchio (36-year-old thief from Voghera), Arnioni (23-year-old Sicilian brigand), Gatti (24-year-old arsonist), Villella (72-year-old Calabrian thief), Chiesi (30-year-old murderer from Pavia), and Macchi (34-year-old thief from Milan). This illustration is from 'L'Homme Criminel', a French edition of 'L'Uomo Delinquente' (1876) by Italian criminologist and physician Cesare Lombroso (1835-1909). Considered the father of criminology, his work was based on physiognomy, anthropology, and evolutionary theory (atavism). 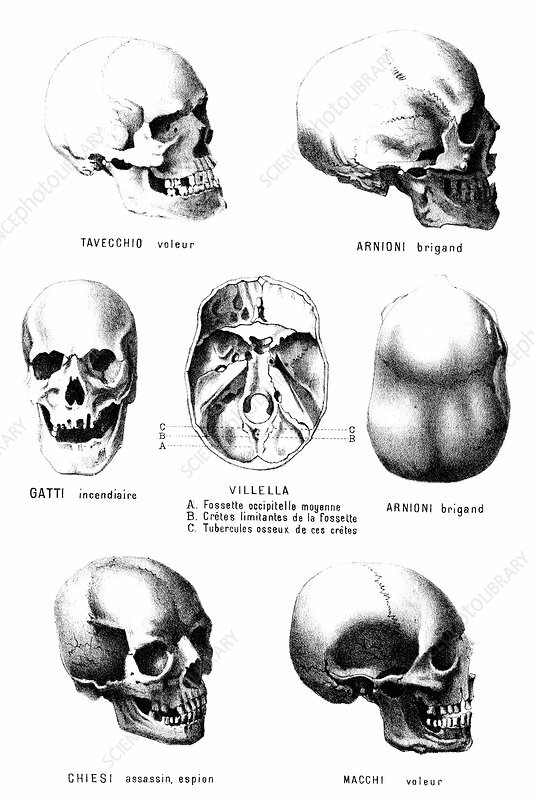 His now-discredited theory (also rejected by many at the time) was that criminality was inherited and that criminals could be identified by physical traits such as skull shape.